Fulfilling the hopes of the San Ramon Valley's farmers and ranchers, the new Southern Pacific Railroad line was completed from Avon (near Martinez) to San Ramon by May 17, 1891. On that day officials and other worthy gentlemen conducted the first official train ride on the line. This was followed by the first official passenger train carrying a jubilant group of passengers on Sunday, June 7, 1891. The train passed through orchards, fields and parts of the county never before seen by many of the passengers. Both groups were delighted with their excursions! Much energy, time and money had come from farmers and landowners to obtain this Avon to San Ramon Line throughout the year of 1890. The 8.65 acres of land for the Danville station was sold to Southern Pacific by John Hartz. The coming of the railroad caused Hartz to survey and sell lots in the Hartz Addition to the Town of Danville. This transformed Danville from a Front Street - oriented village to its present downtown center on Hartz and Railroad Avenues. New businesses provided accommodations and services to rail road passengers. The train opened up this section of central Contra Costa County for shipping farm products, for receiving needed goods and for movement of people. Following the success of the Avon to San Ramon Line, Southern Pacific extended the tracks from San Ramon southward to Radum (near Pleasanton) in 1909, thereby connecting it with the Oakland to Tracy mainline. This important railroad served most people in the Valley directly or indirectly from June 1891 until September 1978. Then Southern Pacific was granted permission from the Interstate Commerce Commission to abandon the middle portion between Concord and Dublin. 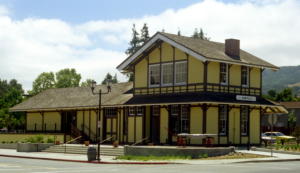 In 1891, using a standard building design (number 18), company employees and private contractors built four main depots at Concord, Walnut Creek, Danville and San Ramon. These two-story combination passenger-freight depots provided room on the ground floor for a waiting room, baggage room, large freight room, and offices for the ticket agent, freight agent, telegraph operator and often for a Wells Fargo agent. The train order window, located on the track side of the depot, provided a view of approaching trains and station activity. Orders were originally transmitted to the crew of the steam locomotive by semaphore signals, which later were replaced by electric signals. Upstairs was a two-bedroom apartment which was the station agent's home. A freight house was built at Alamo (Hemme) and in San Ramon a turntable and engine house were constructed. All SP buildings of this design were painted a faded dandelion gold trimmed in brown. The San Ramon building was dismantled in 1927. The Danville Depot is the sole survivor in its original form. It has now been restored by the Museum of the San Ramon Valley. In 1951 Joe Ramos and his father Joseph Sr. established the Danville Feed and Grain Store. In 1957 they purchased the depot building, leasing the land on which it stood. In order to meet the needs of postwar customers, the business then became Danville Feed and Garden Supply. Joe Jr. provided necessities for the growing community, including hay, burlap sacks, swimming pool supplies and oak firewood. Joe Ramos was a part of downtown Danville until his death November 4, 1987. His Danville Feed & Garden Supply Store represented something stable in a rapidly changing town. It was nice to walk or drive down Railroad Avenue past the old depot building where he often sat outside. The building served as a reminder that trains did journey up and down the Valley. It was small town America. We are indebted to Joe for using and preserving, without major alterations, this historic building. The 20-mile set of tracks linking San Ramon and Martinez was completed in 1891 by Southern Pacific. In 1978 and 1979 the tracks were removed and the right-of-way was preserved by the County and adjacent cities. Community efforts to promote a multi-use, paved trail were successful. Today the Iron Horse Regional Trail is maintained by the East Bay Regional Park District and follows the Southern Pacific's original right-of-way. In year 2000 it was designated as one of the country's Millenium Trails. Danville's Depot has been restored by the Museum of the San Ramon Valley. On June 6, 1996, it was moved 600 feet north from its 1891 location and placed on part of the original Southern Pacific station land. Now located at West Prospect and Railroad Avenues, the building is owned by the Museum. The land is leased from the Town of Danville for a nominal annual sum. The Depot is listed on the National Register of Historic Places and is a Danville Heritage Resource building.